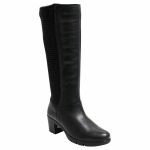 16848 by Paula Urban is an everyday heeled long boot. You would wear 16848 under skirts and dresses or even over the top of jeans. 16848 is made from soft and supple leather that will mould to the shape of your foot. 16848 also has a block heel and a treaded sole giving your grip and support when the terrain gets tough. 16848 has a super stretchy leather and elastane panel that will stretch to fit your calf. 16848 has a shallow shaped oval toe.